For many, Spring is about focus and levelling up in life; be it in your career, at the gym, or in your home. Perhaps you want to travel or plan a wedding, start a family, a business or a passion project! There’s a great atmosphere of creativity and positivity going around, and it’s incredible. Your social media is your virtual home, so make sure it’s filled with content that elicit good feelings and make you feel strong enough to take on the world! With that, I wanted to share my top 10 inspiring accounts that are worth following on Instagram. @BodyPosiPanda – a true body positive force to be reckoned with! I devoured her Body Positive Power book over Christmas and it will be regularly recommended and referred back to throughout 2019 for sure. Not only for the reaffirming messages but for the positive mind frame you’re left with after reading it. @Nathalie_Rattner – Never mind being drawn like a French girl, I want to be illustrated into a pin-up starlet by Nathalie. One day, I’ll have her artwork up in my office, but for now, I’m going to enjoy and swoon over every new illustration she uploads. 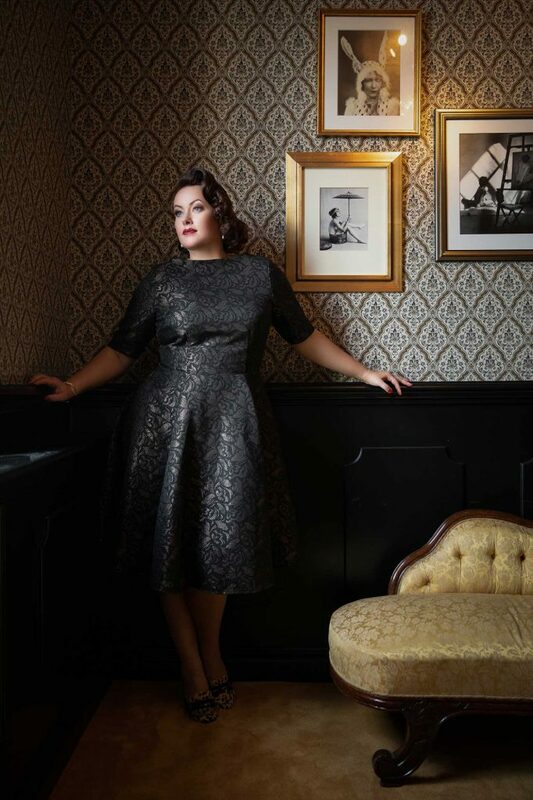 @FullerFigureFullerBust – an absolute force to be reckoned with in the plus size community. Her feed is full of real honest talk about food, plus-sized clothes and brands, exercise, feminism, lingerie, rescue animals; all sorts! A great example of a woman empowering other women! You can also read her interview with her here on my blog. @KrissyCela – Krissy and I actually used to train in the same gym a few years back, and its been amazing watching her transform into the badass, super-relatable fitness queen she is today. Her posts are informative and show a whole bunch of different exercises, accompanied by a hard (and often hilarious!) dose of realness that fitness is not a linear process. I really admire her work ethic, having built her business whilst graduating with a law degree. Emiah – creator of the pearliest lingerie on the internet, Alycia’s feed is a treasure chest of wonderfully decadent creations. The magpie in me adores the amount of shimmer and sparkle and getting to see these creations so close up is a joy. It really makes you appreciate the level of skill that has gone into their creations. @BadHairGoodShoes – Calling all vintage styling lovers, go find Mona on Instagram! I photographed her in Gothenburg last year and her wardrobe for the shoot was beautiful. She’s a wonderfully open human with lots of thoughtful posts on everything from style to body confidence and her whole feed is a vintage lover’s dream. @VioletChachki – Ru Paul’s Drag Race season 7 saw me fall in love with Violet Chachki; the most decadent drag queen (in my opinion) with a wardrobe to die for! Mixing a devilish amount of fetish fashion nods with impeccable vintage styling and THAT much sass… just otherworldly. I’m really hoping to run into them at BHOF. @Miss_Victory_Vegan – I couldn’t share this list without including Miss Victory Violet’s second account, devoted to sharing vegan recipes, cruelty-free beauty products, and tips on reducing your environmental footprint. Travelling with Ella and her husband Matt last year was actually a major catalyst in me becoming vegan in October. @UnderpinningsMuseum – Want to know what I do when I’m not photographing boudoir clients? I’m photographing lingerie! The Underpinnings Museum is a free online museum of lingerie, dating as far back as the 1700s and covering everything right through to the modern day. Being a part of documenting all this historical and contemporary lingerie has been awe-inspiring and Karolina and Lori’s combined knowledge makes for a fascinating read. Did you know Nasa called upon Playtex seamstresses when developing Neil Armstrongs space suit? @CristinaAielli_lingerie – To this day, this incredible Flora neckline soft cup bra is still one of my favourite lingerie pieces I’ve ever shot, and it’s by the sensational Cristina Aielli. Her lingerie is made to measure, and the detail and true couture craftsmanship puts their brand very firmly at the top of my lingerie lust list. What are your favourite inspiring accounts on Instagram? Let me know in the comments below! And remember, if there are accounts that don’t make you feel good when you read/see them or stop your soul from feeling sparkly, don’t allow them into your social media safe space. If you don’t feel you can unfollow them for any reason, remember you can snooze/mute instead, and they won’t get any notification about it.